Because each time you run a screener it runs with the most recent data, the results can change each time you run it. 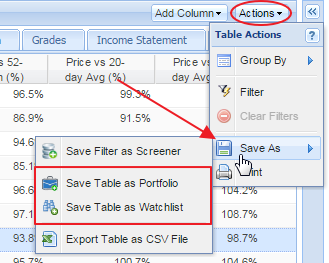 In order to “freeze” the results of a screener, click the ‘Actions’ button in the table’s toolbar, mouseover ‘Save’ select to save the returned list of tickers as a watchlist or as a portfolio. When clicked, a window will appear where you can name the watchlist or portfolio and save it as is, with all of the screener’s matching stocks included, or follow the ‘Click to Customize’ link to modify the watchlist or portfolio further. or the Update a Portfolio sections of this guide.